The night following the Magaly Solier concert, and my last full night in Lima, Jacho and I returned to La Noche, this time for something a bit different. On Thursday night there were listed two acts of a more subte nature: Masacre and Area 7. Masacre was the headline act. 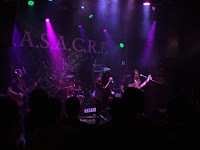 I didn't remember this at the time, but Masacre is a metal band that has been around since the 1980s, and is a mainstay of Peru's metal scene along with bands such as Kranium. Instead, I had half-expected a punkish-type concert. Masacre is an accomplished band and is likeable enough, but truthfully I found some of their music to be pretty standard metal fare. I was more impressed with the opening act, Area 7. Area 7, it turns out, is a band that was started in 1999 by lead singer Diana Foronda, as a metal cover band. 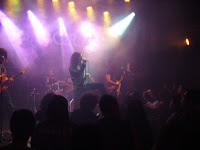 As the lineup changed, the band began to compose their own songs and evolved into an example of Peruvian "Nu Metal" (i.e. 'new metal'). Area 7 stands out for being one of the few all-female Peruvian rock bands, and they're quite good at what they do, to boot. They were a lot of fun to listen to. I'm sure, however, -in fact I know- Jacho would disagree. It was actually kind of an amusing scene. We two forty-somethings posted at the end of the bar with an expensive bottle of pisco, surrounded by disheveled teens and twenty-somethings drinking beer out of 1-L plastic tumblers and whirling about the mosh pit. Jacho's such a good sport for having gone with me! The quality on videos of them on Youtube generally is fairly poor, but good recordings can be listened to here. I specially like "Fuerte, Intenso". From the stage Diana announced that they'll have an album coming out for download by the end of the month. I look forward to getting it. Area 7 has made their newest album, "1984", available free online. 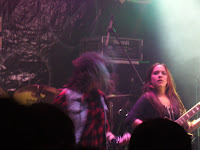 Visit http://www.purevolume.com/area7pe/posts/316954/DESCARGA+NUESTRO+NUEVO+Y+TERCER+DISCO+%221.9.8.4%22 to download all 12 songs.